“Welcome Christmas!’ From haunted houses to a holiday Who-bilation, Universal Orlando Resort transforms from a macabre landscape of familiar and endearing horror IPs to a bright, cheerful Christmas spectacular! Grinchmas and the Macy’s Holiday Parade offer a fabulous opportunity to experience the joy of the Holiday Season with friends and family. With both Universal Studios Florida (US) and Universal’s Islands of Adventure (IoA) theme parks providing ample opportunities to enjoy this festive season, you will find it hard to get it all in one day. With many of the events not beginning until after 3:00pm, the parks offer moderately extended hours until 9/10pm most nights with some later evenings between Christmas and New Years. 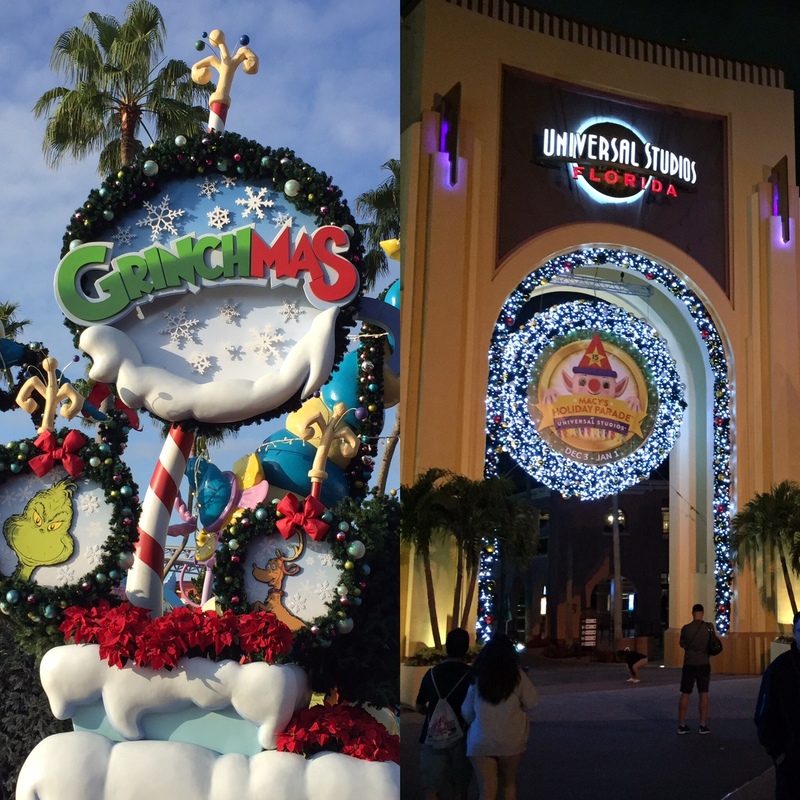 IoA is home to the live show How the Grinch Stole Christmas and US houses the Macy’s Holiday Parade. Although those two events are the headliners, there are other smaller opportunities that are also very much enjoyable. From toy soldiers and elves handing out candy to many photo opportunities with large, familiar Macy’s balloons, there is sure to be something for everyone to enjoy. While many people are all about parades and character meet and greets, my favorite parts of any Christmas limited engagement event at a theme park are the shows, lights, decorations, and music. I love seeing how the theme parks that I visit regularly transform into memorable fantastic holiday celebrations. For those who attend both the Halloween and Christmas events in the parks, it’s incredibly fun to experience the sensation of being in the same building or standing in the queue area that once housed a film/tv-based haunted house, but now is overflowing with colorful Christmas cheer. Both US and IoA are a bountiful buffet of holiday experiences that ARE INCLUDED with general admission or your annual pass. If you are traveling to the area or simply do not have an annual pass, I strongly suggest a 1-day park hopper ticket or a 2-day one park ticket. With happy holiday offerings going on in both parks concurrently, you’ll definitely want to enjoy both for a dynamic experience. Planned well, you can definitely watch both the Grinchmas show and the Macy’s Parade. The holiday season is the busiest time of year in the parks, so you’ll want to note that if you have a brief visit to Universal Orlando, there is a high degree of probability that you may not get to experience all the holiday offerings and the regular operating attractions. Just like the Christmas season creates hustle and bustle in the stores, there is quite the holiday hustle and bustle in the parks as well. All in all, this is the most magical time of year to visit theme parks! Unless you prefer Halloween, then September/October is your most wonderful time of the year! Seuss Landing at Islands of Adventure is home to the official Grinchmas celebration! One of Dr. Seuss’ most beloved stories–if not THE most beloved–is the story of How the Grinch Stole Christmas published by Random House in 1957. Written as social commentary on the commercialization of Christmas, Dr. Seuss’ words in this story have impacted generation after generation through the original narrative, the animated classic, and Universal’s live action film starring Jim Carrey as The Grinch. You don’t have to be a Whovillian to feel a special tug at your heartstrings during the live performance of this most beautiful story at Seuss Landing. Many literary professors feel strongly that The Grinch was Dr. Seuss’ favorite character (followed closely by, if not on par with the Cat in the Hat). Being fond of the Christmas of year’s past, Dr. Seuss was growing irritated at the focus shifting from giving to selling. How the Grinch Stole Christmas was his way of cathartically getting these feelings off his chest. He essentially slid the mortal in sideways. Much like with most of Dr. Seuss works, this story is a creative social commentary on the state of Christmas in a post-modern society. The best part of the Grinchmas show is how it brilliantly combines the efficiency of the storytelling found in the animated classic with the humor of the live action film. It’s neither adapting the animated movie for stage nor is it adapting and abridging the live action film for a theme park setting. The writers of the show, along with the music Chip Davis & Mannheim Steamroller, combine their efforts to create a whole new experience for park guests. There are scenes, jokes, and narration that you won’t find in the book, animated classic, nor live action film. So, just because you have read the book or seen either screen adaption, does not mean that the live show will feel redundant. I see the show every year and absolutely enjoy myself. This year, my friends and I had VIP seating so the show was all the more exciting. With a fantastic narrator, outstanding chorus, and excellent lead characters, this show will keep you entertained and touch that special Christmas place in your heart. “Where are you Christmas?” Right here! As this IS the story of The Grinch, the show includes familiar songs from the animated movie and live action film. The show is greatly helped by the characters not attempting to recreate their respective screen counterparts but borrowing from the book and both movies to create all new characters who embody the best of what the former had to offer. Even the Grinch is a combination of both Boris Karloff’s and Jim Carrey’s Grinches. Don’t miss the opportunity to enjoy the show while the season begins to come to a close. Across the lagoon from IoA is Universal Studios’ Christmas celebration with Macy’s Holiday Parade as the headliner! From Hollywood Blvd to The Garden of Allah to New York City, US has truly decked the halls across the park. Guests can experience the parade during the day or in the evening. With multiple runtimes, there is definitely a chance for everyone to get to enjoy the festivities. Prior to the running of the parade, elves, sugarplums, and other colorful holiday characters interact with guests. You may even get some candies and mints from Santa’s little helpers along the way. The parade floats are larger than life and effectively provide a comparable experience to that of the official Macy’s Thanksgiving Day Parade. If you want a good spot from which to view the parade, be sure to line up at least an hour in advance if not a little more so. There is so much to see and do as Universal Orlando celebrates the holiday season culminating with a top-notch New Year’s Eve celebration this year. As the festivities are included with general park admission, this is an event that anyone visiting the park can enjoy with their friends, family, and loved ones.